Insulated concrete forms (ICF) is a method of building walls for reinforced concrete ordinarily manufactured with a rigid styrofoam insulation that stays in place as a permanent interior and exterior walls. 1. Insulating Concrete Form Walls (in most cases) are wider than your wood framed walls. Because of this most of the outside dimensions on your plans will change by 4 to 6 inches. (Occasionally dimension changes are needed for the front entry door to allow it to fit properly between the thicker walls when building with ICFs). 2. How does the second floor relate to the first? – If they are not directly on top of each other, extra reinforcing of the structure may be required. The most ICF friendly house plans are the ones where floors are on top of each other exactly, due to load bearing points. 3. Dimensions of the length of the concrete walls should be multiples of 8 inches (in most cases). This is due to webs being 8 inches apart from each other, and, therefore, there is less waste when cutting. 4. Windows heights should correspond to the height of the blocks. For example if the ICF block is 16 inches high, window heights should be in multiples of 16 to fit in between the blocks. 5. Look at window sizes. Family rooms often have most of their outside walls covered with windows and small pillars in between the windows. You may have to look at some options that allow for wider columns of concrete between openings. 6. Locations of windows and doors – Are the lintel depths and spans O.K.? 7. Check the tubs. Again, because of the thicker ICF walls, adjustments are required where the bathtub is meant to fit between the two exterior 2 x 4 or 2×6 stud walls. 8. Are there any bay windows? – The thicker ICF walls may make downsizing of the windows necessary. 9. The location of the dryer vent, electrical service, meter locations and any other openings to the outside walls have to be marked on the plans. The location should be decided ahead of time because once the concrete is poured, it is tough to construct the required openings. The location of the Heat Recovery Ventilator also has to be decided ahead of time. Making 8” holes through rebar reinforced concrete is a tough task after the fact. When building with Insulating Concrete Forms, an experienced ICF builder, can offer his client options – to construct the entire home from beginning to end, or only to build the shell from ICFs. Often clients come to us with plans that they have pre-selected. They are concerned whether their plans are suitable for building with ICFs. Can it be built with ICF’s? This is where only an experienced ICF builder can offer reliable advice for all aspects of building ICF homes. Every home can be built with ICFs, but some styles of homes are better suited, and allow ICFs to perform at their optimum. Before making the decision to build with ICFs, the homeowner should take the time to review the entire plan of the home with an experienced ICF builder. Together they can match the benefits of ICFs with the plan and the rest of the construction process and materials. A professional can take a quick look at your plans to see if there are any design issues that would result in building with Insulating Concrete Forms to be too expensive or difficult. He can then suggest appropriate changes if required. It is a fact that most potential ICF customers do quite a bit of research before deciding to build with ICF. We all know the numerous benefits of this type of building – energy efficiency, strength, sound reduction, waterproof, fire resistant, mold resistant, cleaner air, etc. However, if your builder is not experienced, the potential problems and expenses can also be numerous. Once you know what you are doing, building the walls is the easy part – the hard part is making sure all the “pre-work” and decision making has been done in order not to cause major delays and expenses for the homeowner, and frustration for both the builder and the homeowner! This is very informative! 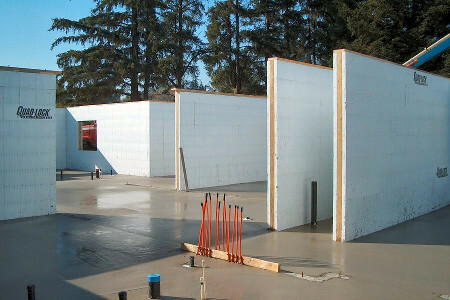 Building with insulated concrete form is the most practical way of constructing big buildings. It is advised for a homeowner to see the details about ICF with an experienced and expert individual during the planning.